How many times have you heard (or said), “My ancestors were plain ol’ farmers”? Or “My ancestors were pretty boring.” (I’ve said that one!) Plain, boring ancestors aren’t the result of their personality; it’s from our lack of building context for them. Most ancestors didn’t leave diaries for us to read, but there are still ways we can learn about the lives they led. 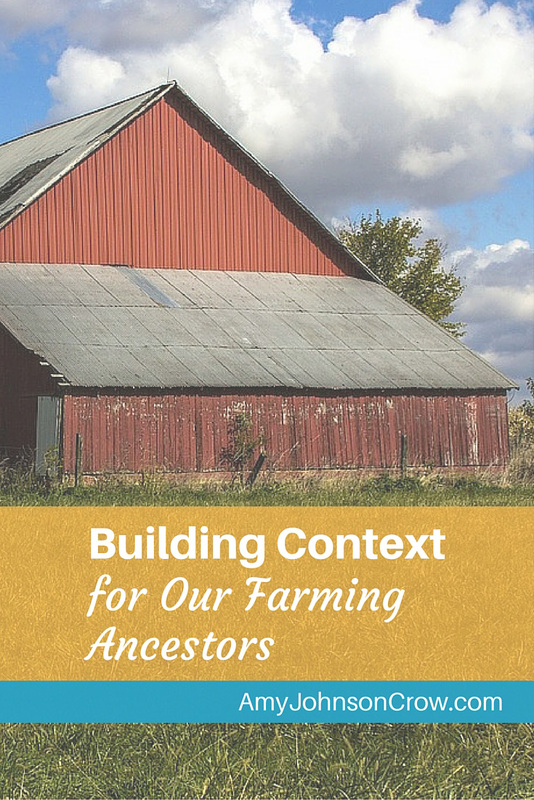 Here are some sources to explore to build context for farming ancestors. Land and tax records have tons of clues for our genealogy research. It’s easy to get lost in the details of the names and locations. Take a step back and look at the bigger picture. How often were they buying and selling land? How old was he when he first bought land? How much did he pay? (I like to use a historic currency converter like Wolfram Alpha to understand how much that would be in today’s dollars.) Take a look at mortgage records. Was he putting up his house and/or his crop each year? All of these things give insight into his economic standing. 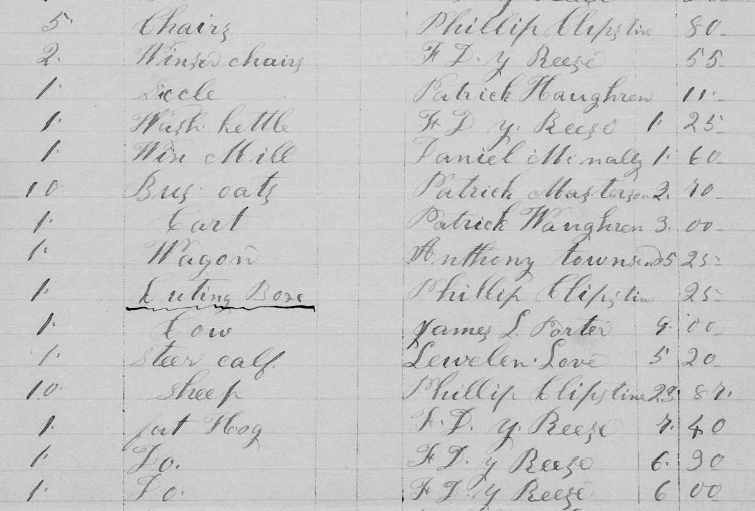 Probate records are goldmines of context. Sometimes you’ll see bits of personality coming through. (Like in the will of a relative of mine, which said that anyone who contests the will would be cut out and receive nothing. I bet there’s a story there!) Beyond the will, take a look at the estate inventory and the sale bill. They give you a list of what the person owned — what a great way to get some context! Andrew Leddy sale bill, 1860, case 844, Perry County, Ohio Probate Court; image on FamilySearch. In the 1850-1880 federal censuses, there were agricultural and industrial schedules taken at the same time as the “regular” population schedules that we typically use. The agricultural schedules show what they were raising (both crops and livestock) and in what quantity. (Read more about agricultural schedules and how you can use them not only for learning more about your farmers, but also a possible way to surprise some family members. 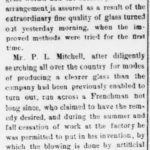 (Carbondale, Illinois) Daily Free Press, 27 April 1904. Image courtesy Newspapers.com. Want to know about life when and where your ancestor lived? Read the newspaper. Don’t stop with the obits and the marriage notices. Read the news. What were the crop prices doing? How were farmers getting their crops and livestock to market? A feature that some newspapers started carrying in the late 1800s was the weekly crop report, taken from either state or national weather bureaus. They give an excellent look into what our farmers were dealing with. In this 1904 crop report, we learn that the weather has been colder than normal and that crops are behind. If your ancestors were farmers in Illinois in 1904, that bit of information gives you a glimpse into what they were living through. Imagine the stress as they wondered if their crops would make it or how many more pigs they would lose to the cold. This is just a few of the sources we can use to gain insight and build context for our farmer ancestors. Have you explored any of these? What other sources have you used? Share in the comments. This entry was posted in tips and tricks and tagged context, farmers, farming by Amy Johnson Crow. Bookmark the permalink. Just shared to my Facebook group, Irish Roots Hunters. 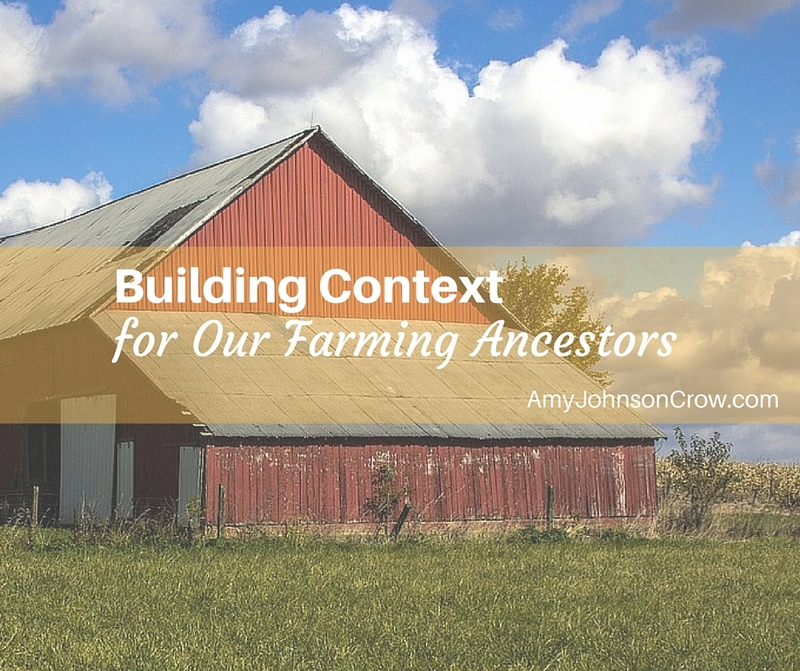 I’m a firm believer in building context – putting meat on the bones formed from finding censuses and other records. I read county history books published in the 19th century. Many mention my ancestors by name, but even when they don’t they give me a lot of great contextual information. Yes! Those old county histories are great. Many of my ancestors in Alabama were sharecroppers, although listed in the census as farmers. I’ve been searching for them but so far not much luck. 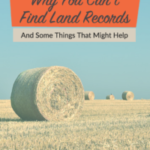 Do you or anyone have any pearls of wisdom on locating records? It’s my understanding sharecropping meant they paid their rent in crops so am I correct that they wouldn’t have done the same agriculture schedules? Thanks a bunch! I haven’t done any work with southern sharecroppers. I’m not sure if their financial arrangements would have been recorded anywhere or not. Other readers — do you have any insight for Melanie? Deed books in Lafayette Co., MS, record contracts between land owners and tenants. The contracts specified how many acres of land and where it was, how many bales of cotton or whatever would be paid as rent, and what the landowner would supply (teams of mules, tools, seeds, etc.) Sometimes they specified that the tenant was to build a fence or clean out ditches or some other improvement to the property. I haven’t looked in Alabama, but they would probably have similar contracts in deed books. Thanks for that information, Annette! That’s very helpful. Thank you for these suggestions and tips. Your newspaper section was motivating! 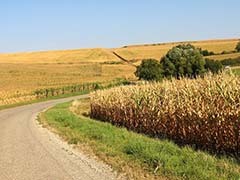 I live in the Carbondale, IL area and have ancestors that were farming in this area in 1904! I love getting a glimpse into their daily lives. I recently subscribed to newspapers.com and am looking forward to “reading” the paper. Thanks again. Very cool! It looks like the paper there published the crop reports regularly. Have fun with them! Wonderful post! You made several suggestions I haven’t heard before. Love it! Those estate inventories and accountings really can tell or at least suggest tales. Epaulettes, a feathered hat and a sword. A merchant’s charges for a half-pint of whiskey at least every other day for a protracted period. A merchant’s account book showing a week of selling unusual quantities of calico, lace, ribbon and thread — someone throwing a major party, maybe a wedding? A household 1830s+ with no loom listed, but at least one coverlet, had a “spare” $3 to $5 to spend for each coverlet. Those manuscript merchants’ account books in local collections are treasures to be sought. Amy, I agree that the details of our ancestors’ farm life is fascinating. I wrote about a 1881 government report on agriculture in Ontario here http://wherethestorytakesme.ca/picture-of-ontario-farming/ (which also includes some stuff about Tennessee.) Might there have been similar state-sponsored reports? As usual, lots of great tips here and mighty helpful for those of us with farmer ancestors. I’m very curious about the threat to anyone who would consider contesting your ancestor’s will. Sounds like a story there for sure! I have a lot of farmers in my tree as well. Thanks for the tips! You’re welcome! I hope you find lots of neat things! Great article! I have Iowa farming relatives and found a wonderful children’s picture book that fit the time period about Iowa farming. What a gold mine! Pictures, everyday life, tools, social community, etc. I want to suggest that everyone check out the children’s section of the library when they want to get a simple clear image of life in another time and/or place. Yes! That’s one of my favorite ways to do that, too! 3 questions when I started Ancestry I didn,t know what I was doing. 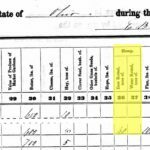 I cam across a census 1930? 1940? Of my grandmothers residency at Drake Hospital, Chicago, for some kind of treatment. But I didn’t save it. SAME w a federal court transcript of my grandfather @ 1920-1930? Medicinal Formula miracle drug in1920- 1935? I have not been able to find them in 8 years. Suggestions? Why did the show up easily in the beginning?